Just look at that! Isn't it the prettiest, most perfect plate of food you've ever seen? Unfortunately (for me), it isn't one of mine. 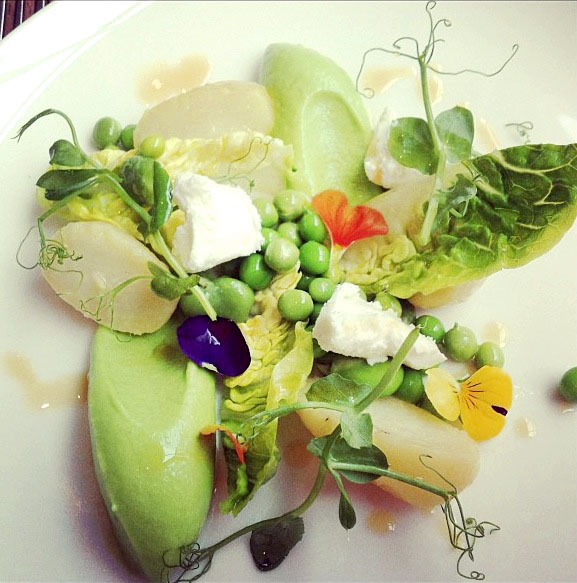 This is the Summer Salad currently being served at Arbutus restaurant - the creation of chef-patron Anthony Demetre. I also must flag co-owner Will Smith for his commitment and professionalism. This is a man who knows how to keep his customers coming back again and again. Cheers Will. 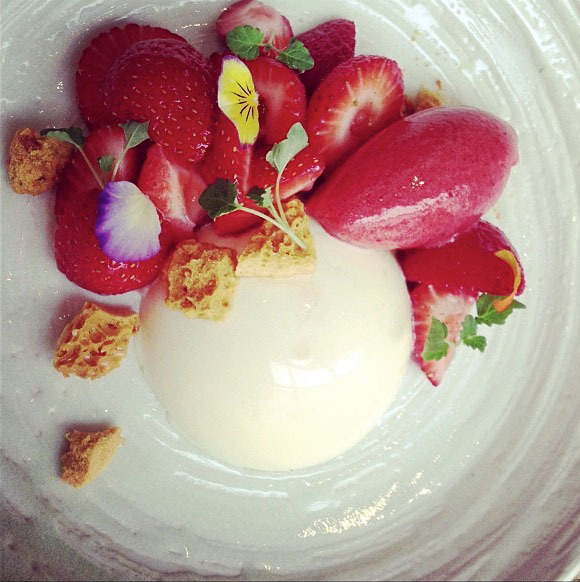 Below is the Arbutus pannacotta and strawberry dessert. Both dishes were as delicious as they looked. I didn't even take the photographs though. These are the work of Kerstin Rodgers, the hugely entertaining and fabulously ebullient food blogger and grande dame of the UK's home restaurant movement. We met for lunch in the week. Finally! She's a very busy woman. This was my fourth attempt to pin her down as she'd kept being flown on food junkets to: Mexico, Denmark and then the Shetland Isles. Kerstin, Mrs Marmite Lover to her Twitterati, was naturally a wealth of information and hilarious stories of cooking, blogging and uppity celebs. She has 15,000 Twitter followers and her blog receives 100,000 hits a month. Puts my efforts in the shade. But she did point out that the majority of blogs fold after three months so I seem to be past the first hurdle. So onto the weekend. Two parties of ten. The photo below is of Nicole and her friends and husband who came to celebrate her birthday on Saturday. One of the friendliest, happiest and certainly the loudest (they won't mind me saying) groups I've entertained. I knew they were determined to enjoy themselves when husband Maurice turned up with a magnum of Champagne, the largest wine box I've ever seen - at least 20 litres of Chinon, some Courvoisier brandy and a mysterious, unlabelled bottle containing what looked like olive oil but was, it transpired, a rural and rather fine 'eau de vie', obtained from a farm on a recent trip in the Loire. Being largely of Trinidadian heritage, the women asked for (and got) an evening of Soca music. Did they dance? Of course they did. Dinner was the French gnocchi with lardons and broad beans for starter; mains of lemon and basil barley risotto (featuring my new Basil oil) and dessert of vanilla cheesecake and raspberries. I maintain my cheesecake is a world beater. It's actually an Anthony Demetre recipe. One of their guests didn't do cheese however, so I improvised a dessert by poaching a peach; serving it with raspberries and crystallised pistachios. This reminded me of a dish I keep planning to do using poached peaches (the M. Roux Snr technique using a rosemary sugar syrup) and an architectural orange tuile. Architectural? Photos soon I hope. The chicken and barley they ate. Not nearly as pretty as the pics above. I know. Sigh.